When Mr and Mrs Oldham moved into their detached home in Romiley three years ago, it was as tenants. As time passed, the couple fell in love with the house and asked their landlord whether he would be prepared to sell. Luck was on their side: they purchased the house and set about making it their own. “We looked around a lot of other places, but many of them were very ‘samey’ – and the cabinets weren’t all that good quality when you had a closer look. “We’d been to Housing Units, where Kitchen Design Centre’s Manchester showroom is based, plenty of times but we’d never actually been into the showroom. This time, though, we just wandered in and spotted the kitchen we ended up with straight away – it was a total eureka moment! The kitchen that caught the couple’s eye was a chic traditional kitchen with smooth lines and rounded edges adding a touch of modernity. Painted oak shaker-style cupboard doors add a touch of colour, while Bethel White granite work surfaces add texture and interest. 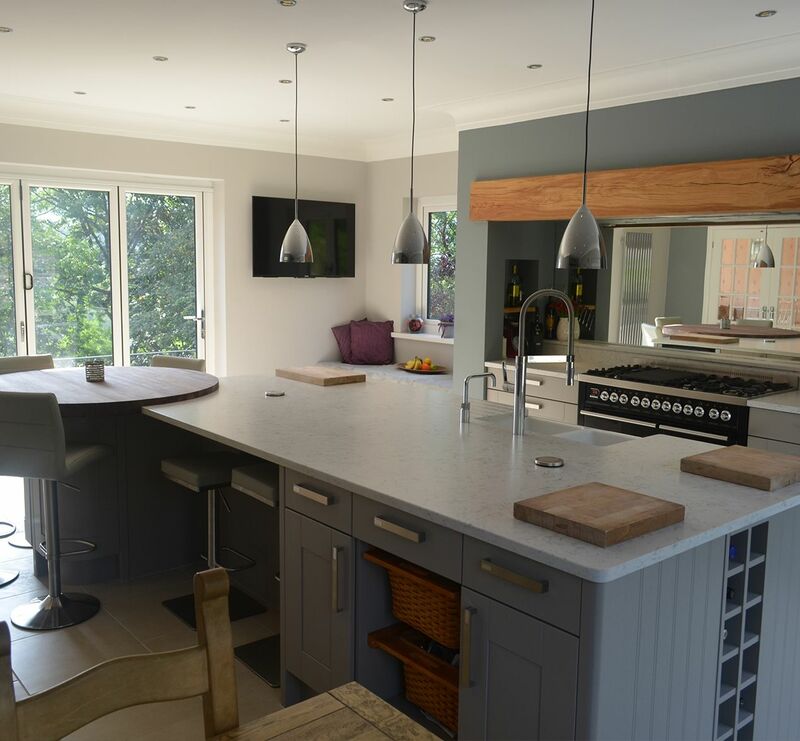 The kitchen has been tailored to fit perfectly in the Oldhams’ home, and stylish finishing touches really make it their own. A rustic mantel frames the cooking area, where a top quality ex-display Britannia range cooker takes pride of place. These traditional features are balanced out by the contemporary mirror splash-back that opens up the room, reflecting the peninsula and the cosy dining area beyond. On either side, panels of Safari Brasilica wood add warmth and natural beauty to the room, replicated by the gently curving breakfast bar and sideboard, both in the same material. 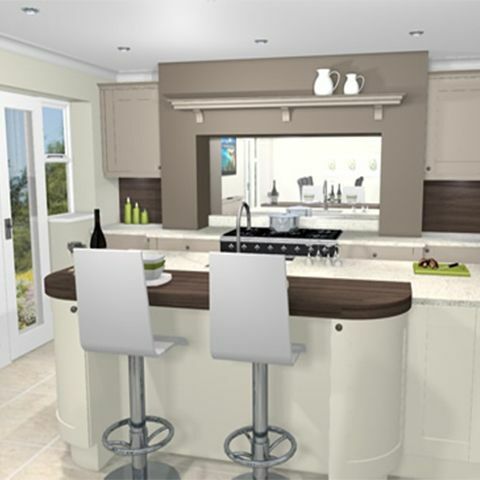 “The cabinets are just fantastic quality. They’re a rounded shaker style, and they’re two toned – off white and a beautiful grey-green colour. Despite a traditional feel, the kitchen is designed to make life easier for the couple, boasting a discreet Neff built-under fridge, a beautiful antique white butler sink, and an Ionian mixer tap in chic chrome. The couple also opted for a state-of-the-art Neff dishwasher with the TimeLight projection system, which displays the remaining cycle time on to the floor. Curved base units on the back of the new peninsula, which replaces a clumsy island, form part of a casual seating area, where the couple can cosy up on stylish high stools that tuck in neatly. 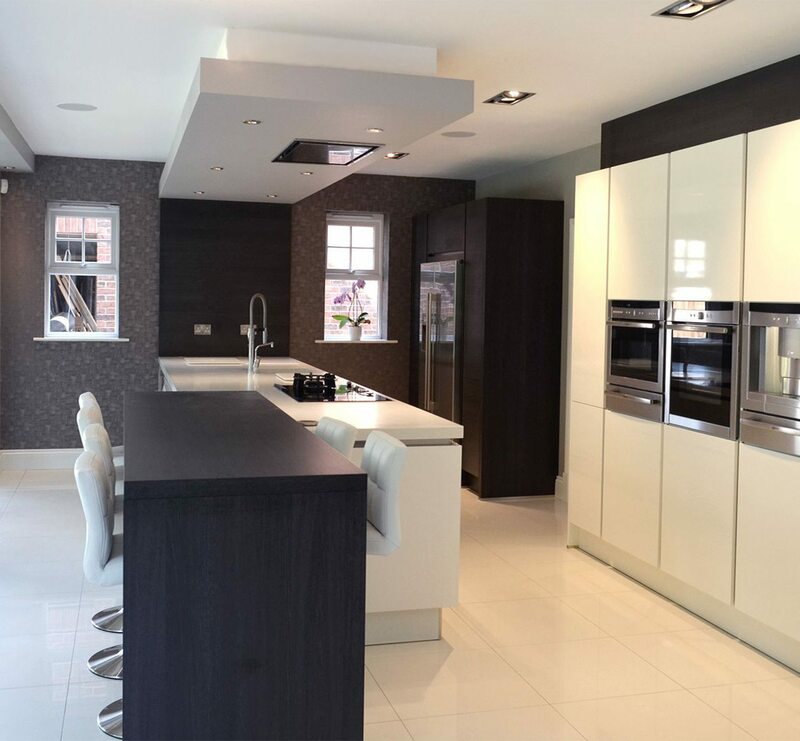 And it’s not just the beautiful designer kitchen that won praise from Mrs Oldham – she had plenty to recommend about Kitchen Design Centre, too. 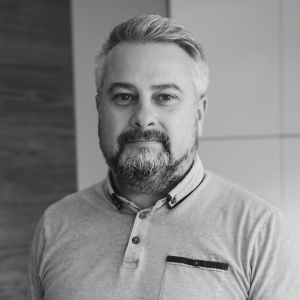 “Our designer Paul has a lovely personality – he came to the house, sat down with us and took his time getting a feel for what we wanted and how the kitchen should work for us. He talked to us about where we move and what we do in the kitchen, and that’s how he decided where the different components would fit best. 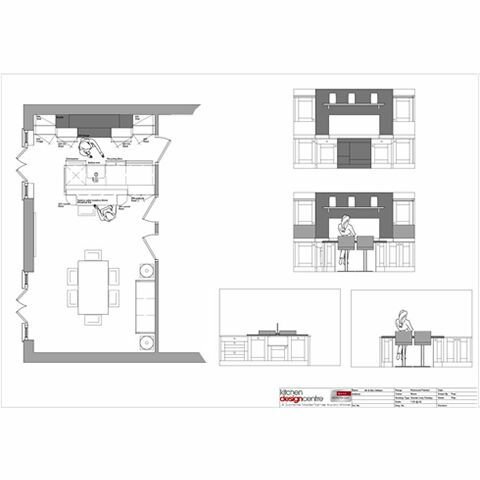 "We just fell in love with the kitchen we bought from Kitchen Design Centre. 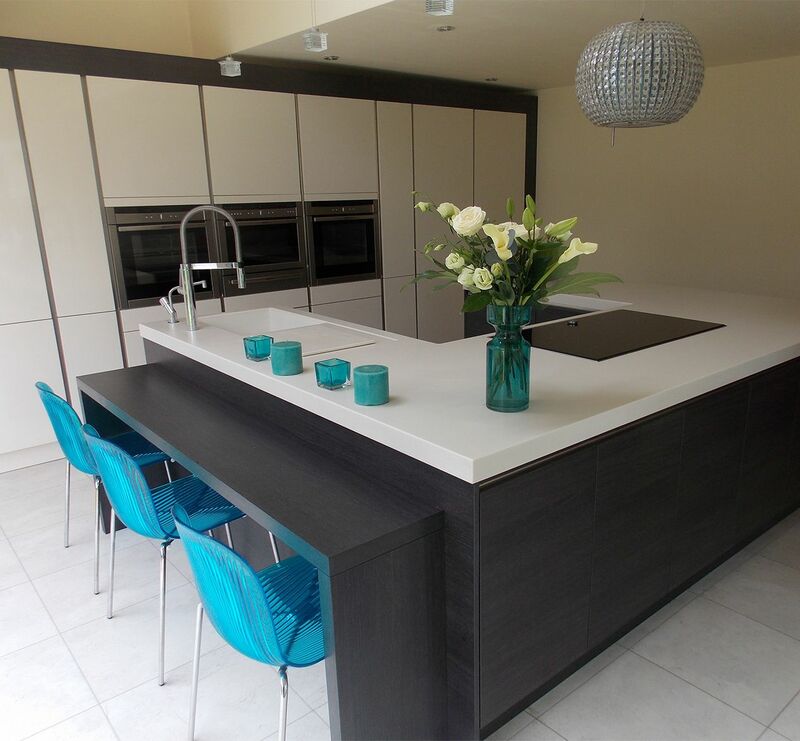 Once we saw it, there was no point looking anywhere else..."
"The Oldhams are a lovely couple, and this was actually a really straight-forward project thanks to the fact that they walked into our showroom and spotted the kitchen of their dreams right in front of them!" 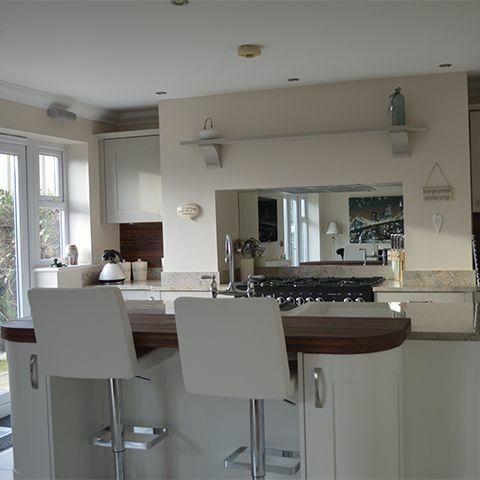 "I’m really pleased with the way this stylish traditional kitchen fits into Mr and Mrs Oldham’s home. We’ve taken something inherently classical and added some modern touches that tie in neatly to the sociable dining area for a really lovely overall effect."